All of our windows and doors are factory painted prior to assembly, providing complete protection from moisture absorption and maximising longevity. Every product receives a base coat of timber preservative, then a primer coat, followed by two coats of micro-porous paint. You should expect our coatings to last from five to eight years without the need for re-treatment. Should you wish to change the colour of your windows then redecoration is a very simple task as there is no sanding down required. An average window should take about thirty minutes to re-decorate. Glass is fitted from room side to prohibit would-be intruders from gaining entry by removing the glass. Purpose-made grooves on the inside and outside of the window receive the silicone necessary to protect against water ingress. Appropriate coloured or clear silicone is factory applied, guaranteeing a perfect, unobtrusive seal. Ventilation channels protect against the failure of double glazed units. In standard systems misting can occur when glazing units are allowed to sit in water trapped within the frame. The use of multi-layer timber for windows and doors is long established in Scandinavia and Northern Europe, but very rare in Britain. The multi-layer structure used as standard throughout our range is particularly effective in resisting warping and twisting, as the opposing grains even out natural moisture movement. It is the twisting of timber during wet weather, more than the swelling itself, which causes standard wooden windows and doors to stick. 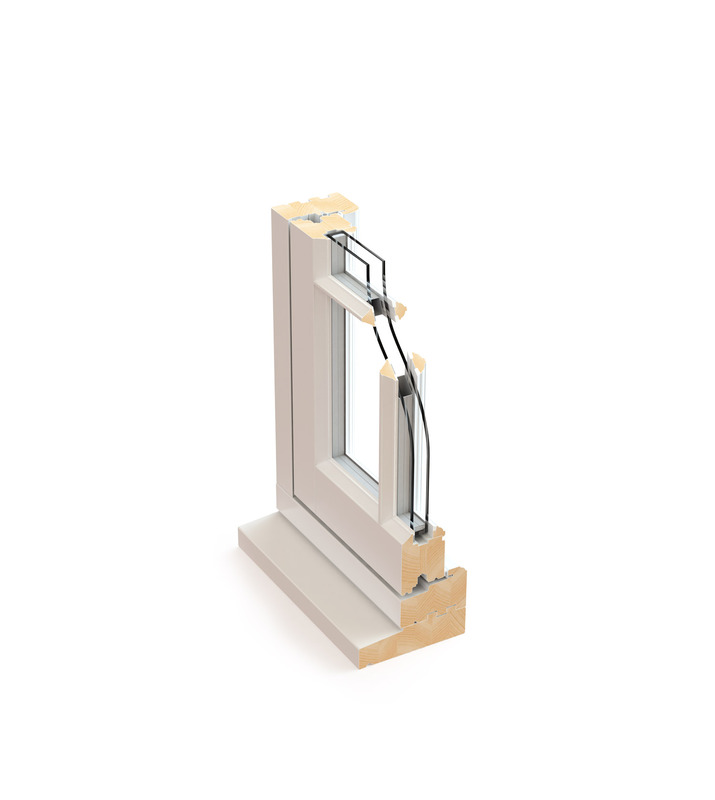 All of our windows and doors incorporate double-glazed units with enhanced thermally insulating glass, providing an extremely low U-value.We further improve the efficiency of the unit by filling the cavity with argon gas and using low conductivity spacer bars to minimise edge losses. The result is a 1.1 W/m2K centre pane U-value. This means an 80% increase in energy savings compared to single glazing, and a 45% increase in energy savings compared to ordinary double-glazing. Advanced glass technology not only provides enhanced thermal performance but also much improved clarity, particularly compared to traditional hard coated low e glasses. High light transmittance (77%) maximises the entry of natural light into the home. Low conductivity spacer bars help to minimise heat loss and combat condensation levels on the inner pane. In standard timber systems, paint is prone to cracking at the point where the bead meets the window frame. By rebating the glazing bead over the sash we conceal the joint, which eliminates the problem. All Timber Windows are fitted with advanced security locks that wrap around the openers on our Flush Casements and engage bolts in multiple points on our Lipped Casements. Doors are fitted with multi-point locking mechanisms, featuring hook-bolts and deadlock.